WEST LAFAYETTE, Ind. — Purdue University’s College of Science is inviting parents and children to learn about computer science together through the “Are You Smarter than Your Fifth Grader?” program. The program, a series of four workshops, offers programming and graphic design activities for students in grades four through six and their parents or guardians. Parent and student pairs will create their own digital world to tell a story and will work with robotics using the ALICE 3D graphic design program and PicoCricket design studio. Participants will be able to keep their PicoCricket Design Kit, valued at $250. The workshops are 9 a.m. to 1 p.m. on Jan.9, Jan. 23, Feb. 6 and Feb. 20 in the Lawson Computer Science Building. The program is free, but a $25 deposit is required to register. The $25 will be returned to participants upon completion of all of the workshop sessions. 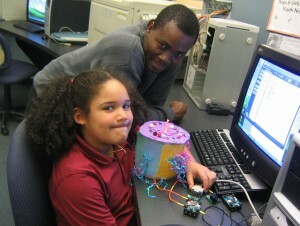 A Motorola Foundation Innovation Generation Grant funds the program.